I think this must be a skill, some are able to master it and others have quite some difficulty. Why in the world and I writing about twirling pasta? We opted to take dh to the Olive Garden for lunch as an early part of his Father’s Day gift. Spencer had pizza (not a surprise), dh and I had a salad and Nate went for the Tour of Italy plate. Now, he (Nate) is only 11 but trust me he can put away some mass quantity of food. Nate started off his meal with a soup (he ate nice portion of it - the child that does not normally eat soup), two bread sticks, and then his meal arrived. He had upon his plate was a serving of Alfredo noodles, Chicken Parmigiana and Lasagna. Now, he ate ¾ of his chicken, all of his pasta and a few bites of the lasagna. Pasta, Nate adores pasta; he is currently on a big kick of Chinese noodles. So, he is sitting across from just me eating away. I have a flash back to when he was three and I tried to teach him how to twirl is pasta. It was simply a disaster. Flash forward to today and there he was slurping up the noodles. Not twirling them, not even attempting to twirl. Dh showed him how to twirl properly, but for some reason he just could not get the hang of it. Noodles were flopping off his fork, too much on his fork, and a simply frustrated child. When we came home, I spent some time just surfing the net as my down time. That was when I stumbled upon the automatic spaghetti twirling fork and a light bulb went off for me. Why not write about twirling pasta? 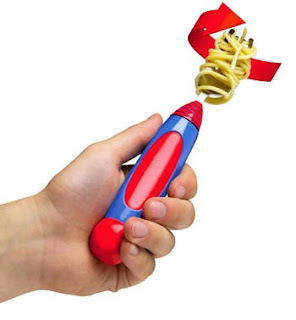 So, if you know of someone who would benefit from the automatic spaghetti twirling fork, you can purchase one here. Free Krispy Kreme Doughnut - TODAY!